Big News – We’ve finally added a newsletter to our blog. After having several readers request it, we worked with our web developer and got it put together! Yay! We promise it won’t clog up your inbox. We plan to send it out just a few times a month to let you know about new articles and resources available on our blog. To subscribe, just scroll to the end of this post or any other post and enter your email. Now onto the next big news – to celebrate this big milestone, we are sharing a free game! Woohoo! Both of our Rhythm Bingo games (here and here) have been huge hits with our own students as well as our readers’ students. We wanted to create another bingo game that reviewed reading this time. This game is very simple with only skips and steps or 2nds and 3rds. Which makes it easy for beginners to jump into this game very quickly! Since I teach a lot of private lessons, I like to pull these out as we overlap lessons for a quick 5 min. game. Two students with a box of doo-dads (I often just have my paperclips handy) and you’re ready to play! With my students, I like to have them practice saying “Up a step, down a skip…” and so on as we draw these cards. Hope you enjoy the game and our newsletter! Thank you for the great resources! I’m looking forward to using this with my first-year students. Thanks for sharing this neat game! I have a question. 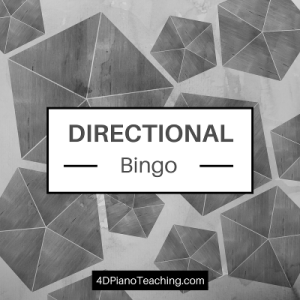 When I printed the Directional Bingo Game, all of the pages looked like the actual bingo cards. I’m wondering if you have a printable to create the cards for the draw pile, or a list of all the possible patterns used in the game? Thanks very much! Hey Donna, glad you printed this resource off. If you look closely, pages 7-8 of the game are missing “Free Spaces” in the middle and these are meant to be cut up to use as the draw pile. There are 18 cards that cover all possible patterns in the game. Enjoy!